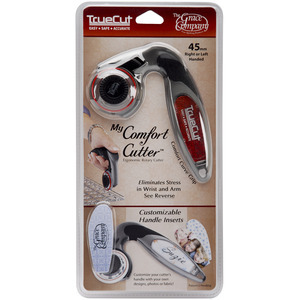 With the My Comfort Cutter, you can customize your rotary cutter's handle with your own designs, photos or fabric! This new ergonomic rotary cutter has a unique handle design that aligns your wrist naturally, placing all cutting power directly over the blade and eliminating stress in the wrist and arm. 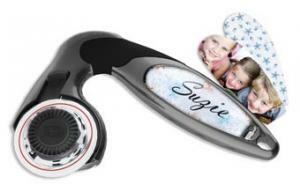 With the My Comfort Cutter, you can customize your rotary cutter's handle with your own designs, photos or fabric! Grace TrueCut GCTCRBS Rotary Blade Sharpener, Non Skid Track 11-3/4"